Devoid Of Culture And Indifferent To The Arts: Foraging 16: A Dandy Breakfast? Dandelion syrup and pancakes! Foraging 16: A Dandy Breakfast? Dandelion syrup and pancakes! I hope this post isn’t too late. On my walks recently I have seen that the dandelion have been going to seed far quicker than my kitchen would like. I have a thousand things I want to do with them. A few night ago we had a delicious meal. We had broiled mackerel with a warm dandelion greens salad (with bacon and scallions). I harvested the dandelion leaves just before making dinner, so they were good and fresh. I now turn up my noes to store-purchased dandelion greens. I have never seen such an ugly excuse for a vegetable in all my life. I actually purchased enough for the meal the previous night and by the time to eat they were fit for naught but the garbage. In all seriousness, go out into your back yard, find a clean leaf and shove it in your mouth. You will be pleasantly surprised. Their taste is quite similar to rocket in mesclun mixed greens. We really should be eating them. What a waste!!! Dandelion greens will henceforth be an important part of my Spring/Summer diet. The taste is excellent and you can’t beat the price. Today’s little concoction focusses solely on the blossoms, or more precisely, petals. It’s for breakfast, but the syrup part would have to be done at least a day before as it takes more time. I haven’t tried this yet, but will be doing so as soon as I can gather enough to accomplish the feat. If by chance you’re still infested, this will help use up those dandelion blossoms. It’s a recipe (well two actually) for Dandelion Pancakes with Syrup. 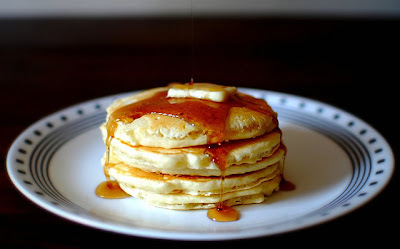 I have found this syrup recipe on several sites so I don’t actually know who to thank. Clean the heads of any unwanted insect “guests” as well as the green parts. We only want the petals. I find squeezing the base of the flower dislodges the petals fairly well. Cut one wide strip of lemon rind and reserve. Squeeze the juice from the lemon and place it in a large saucepan. Place the petals and water into the pan with the juice. Bring to a boil, reduce heat and gently simmer for 1 hour. Add the lemon rind to the hot syrup and let it all steep, covered, in the refrigerator overnight. In the morning, strain the petals and rind from the liquid. Reheat the strained liquid and add the 2 cups of sugar. Bring to a boil and then reduce the heat to simmer. 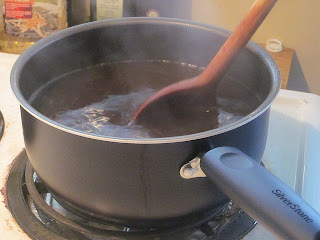 Let the syrup simmer for about 1 hour until it starts to become thicker. 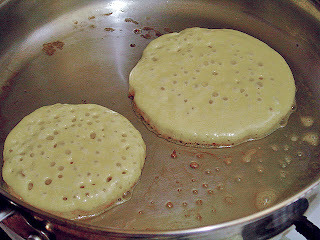 Remember the syrup will thicken more when cooled. 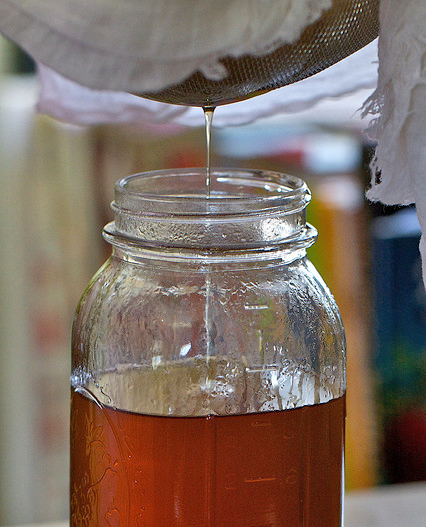 Store in an airtight container, like a jar, in the refrigerator. Pick the dandelion heads and remove the petals. In a large bowl sift together the flour, baking powder, salt and sugar. Mix in the milk, followed by the eggs and butter. Beat just until a smooth consistency. If you wanted you could also add a little bit of cinnamon which would go well with the flowery aspect of the petals. 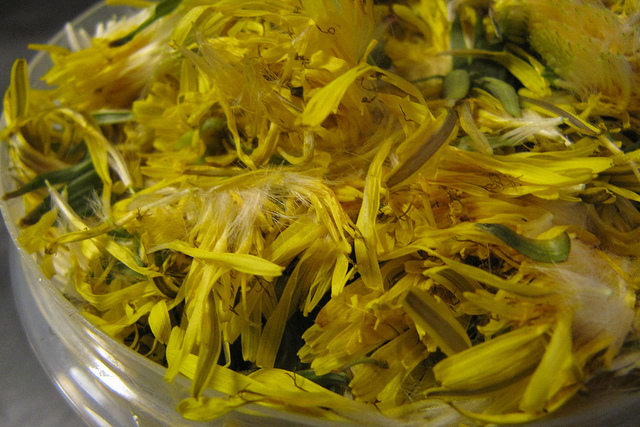 After the batter has rested for 10 minutes, stir in the dandelion petals, making sure they don’t clump up. 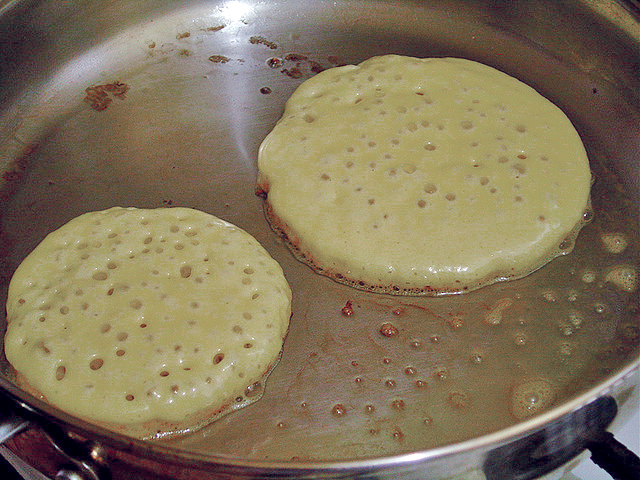 Pour 1/4 cup of batter onto a hot griddle. Brown on both sides. Serve with the dandelion syrup, some butter et voila!